If you wish to apply for our student exchange program, please apply at your home university which has an exchange program agreement with the Faculty of Integrated Arts and Sciences, Tokushima University. Please click and view the “Procedure of Enrollment” for Application Process, Visa, accommodation and Health Insurance information. Japanese language proficiency to be able to take lectures and tests in Japanese without translation. 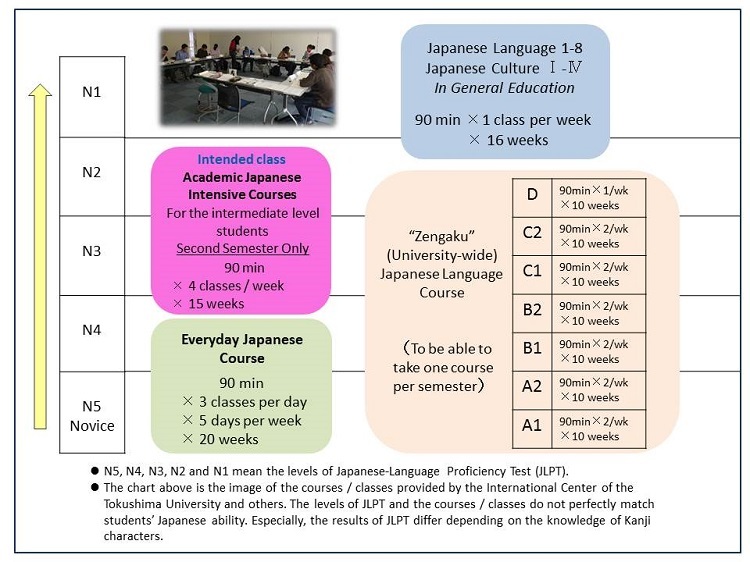 JLPT (Japanese Language Proficiency Test) Level 3 (N3) or higher is desirable. If applicants do not have a JLPT certificate, supporting documents to prove their Japanese proficiency (being equivalent to or higher than N3) will be required. If your Study abroad at Tokushima University is mainly for research purpose, please submit “Schedule Form of the Study” with your application documents. Also we request you to submit “Status Report of the Study” every month during your study abroad in Tokushima. When your study abroad at Tokushima University is concluded, please submit “Report of the Study”. We offer the ICP (International Culture Program) and Japanese Language Education for students whose Japanese level is lower than N3 to improve their Japanese level in their first semester. We provide the above courses except “Everyday Japanese Course” for exchange students. Copyright © 2019 徳島大学総合科学部 国際交流委員会. All Rights Reserved.